Shankaracharya is a western born Preceptor (Guru) holding the seat of an ancient lineage in the Chandika Sampradaya. He was initiated into the esoteric practices of this mystical Divine Mother tradition by the respected Himalayan Adept Ramesh Moudgil and was later ordained a monk in the Tantric Order of Dakshina Marg. For over 30 years, Shankaracharya has conducted meditation programs around the country. Hinduism Today heralds his book, "God Alone Is," as "a rainfall of insight and inspiration." He was a featured speaker on Hinduism, in the television production entitled, "Religions of The World," narrated by Ben Kingsley and has also been featured in the book, "What Matters Most," as a notable Nashvillian, an honored personage in the town where he previously resided. Shankaracharya closely served the renowned meditation masters, Balyogeshwar Maharaj, Swami Muktananda, and Dhyanyogi Madhusudandas, making pioneering efforts in the establishment of their U.S. missions. 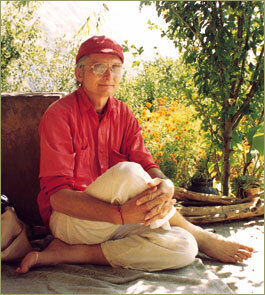 He also has strong spiritual ties with Anandamayi Ma, Swami Madhavananda and Shri Ramakrishna. In 1981, while in India on pilgrimage, Shankaracharya was blessed with the direct realization he refers to as "God Alone Is."